7" non-marring, shock absorbing rubber wheels. Large toe plate for a hauling bulky items. Fits easily into back seat or trunk of vehicles. A must have for all home owners. The Black Jack Mover has a lightweight aluminum frame for easy handling make this truck ideal for sales staff, travelers and small offices. Telescoping handle, retractable wheels and fold-up toe plate. 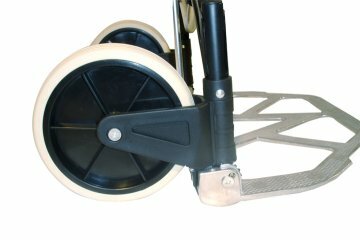 Special Feature: The Black Jack Mover's wheels and toe plate open when you raise the handle. Additionally, the wheels and toe plate close when the handle is push into the closed position. This is a great feature that will save time and eliminates the need to manual close the toe plate and wheels seperately. A great feature to have for quick storage when your hands are full. Versatile, collapsible design fits into small spaces for compact storage when not in use. 19 x 11" fold-up toe plate. Elastic cord for securing loads. Unit has 7" diameter solid rubber tires. Works as it is described. It does the job that I need it to do. I Love Love Love this little cart, Light weight easy to fold and unfold. Perfect for moving file boxes in and out of the courthouse. The wide base makes it very stable for transporting several at one time. This was a great purchase. Handles so many things without the backache of carrying heavy bags, boxes, etc. And best of all ...lightweight and easy to use. 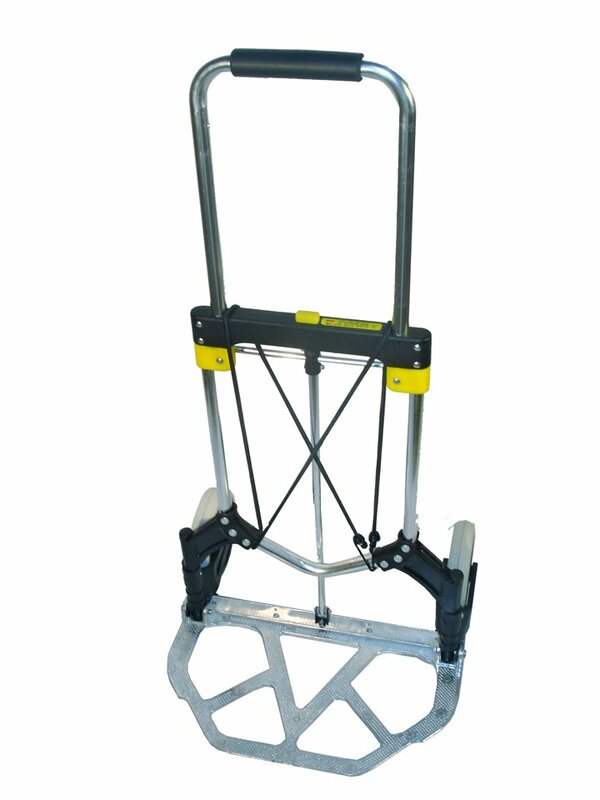 The Black Jack is very good lightweight hand truck. I use for for guitar amp and accessories. The large wheels make navigating NYC curbs easy. 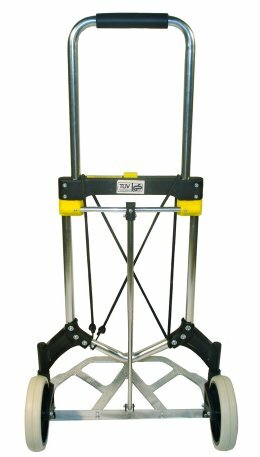 I like how easy this portable hand truck is to use and how it folds up flat so I can store it anywhere. Good job! i bought this cart to wheel drums to and from the stage to my vehicle. my older cart was a little smaller. i wanted something with a little higher weight rating and larger wheels. this one fits the bill and wasn't too expensive in comparison with other carts this size. it's holding up just fine and would recommend to others. Great product! Carry in the trunk of my car at all times. So valuable for toting heavy objects. Ideal for my job, when I have those large or multiple parts to bring in to an account. Easy to use, rugged construction, and nice large wheels! Love it!! I especially like the light weight and how it folds so compact for storage. Makes my life so much easier! Great cart. I now own two, one at the home on Cape Cod and the other at the home in Florida. I use it as the shooting range cart. Never had a problem with either one. Product is excellent sturdy and well thought out. Compacts nicely and rolls very smooth. The transaction with the vendor was seamless and everything arrived timely and in perfect condition. I especially like the way it folds with the use of the telescopic handle. For musicians, this or another one like it is essential! We used the folding cart to help move my son to college. Worked great and being able to fold it up is very convenient. 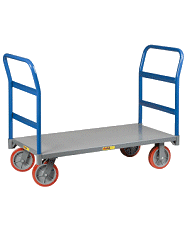 This cart is an unbelievably wellconstructed, light weight, inexpensive solution for those who need to move items back and forth between house and car, car and office, etc. The cart can be folded flat quickly and easilywith just one hand. The Mighty Max may not be quite as wellbalanced as some much more expensive carts however, I spent quite a bit of time researching similar items and I believe that, for the money, you won't find a better cart anywhere. We ordered this to carry supplies to and from our meetings and it works great! It goes down stairs, and carries everything securely. Thanks for the great product! got this for my brother and he loves it! very versatile. The foldup cart is great! Takes up very little room, ordering was easy and delivery was on time. Tks. Great doing business with you guys. Fast shipping and quality product. Sturdy, quality product. Great capacity and easy to use. Very pleased with the handtruck. I bought this handtruck so I could move my huge container plants around my patio and in and out of my house ALL BY MYSELF, and not have to call my exboyfriend to loan me his muscles! And it works PERFECTLY for that! It makes me feel very INDEPENDENT thank you! 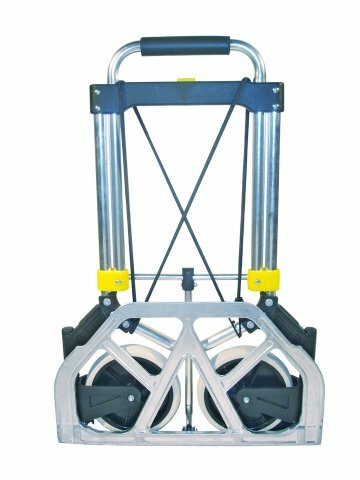 I purchased this folding hand truck to allow me to move my PA System from my vehicle to inside a church. So far it is great. It is very light weight and easy to use. If it is as durable as it is easy to use, I've purchased a great asset to help me in my ministry.God bless you for providing such a great piece of equipment !!! 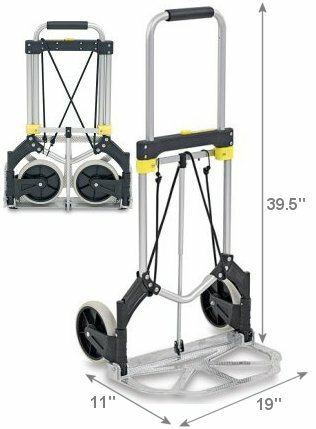 Needed a strong yet compact hand truck for my vending business that could fold up and store in the trunk when I switched from a station wagon to a Mid sized car. Mighty Max had the lift compacity, storage and manuverbility that I needed it meets all my expectations! I use it to hall stackable crates full of engineering code books while studying for my Professional Engineering exam. Perfect. Folds easily, fits anywhere, wheels big enough for rough terrain, and very sturdy. ONLY complaint: Handle could be a little longer. Great service! Solid construction at reasonable prices! We couldn't be happier.